Enchant creature Enchanted creature gets +2/+1 and has "R: This creature gains trample until end of turn." 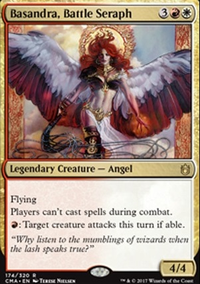 Massacre Girl is a member of the Rakdos guild on Ravnica who has been mentioned in the flavor text of numerous cards and several stories on the main website, but has not yet been depicted in a card (although most players believe that the woman in Deviant Glee is her). Mark Rosewater hinted on his Tumblr account that she may eventually appear in a supplemental set, so I would very much like to see her, there, although that raises the question of why she has not been given a card in either the second or third Ravnica blocks. First thing, your deck is in standard, but you're not playing standard legal cards. I assume you meant modern? You should change it. your deck has some really expensive cards for an infect deck. Black gets access to a few proliferate cards. Replace Spread the Sickness with 4x Grim Affliction. 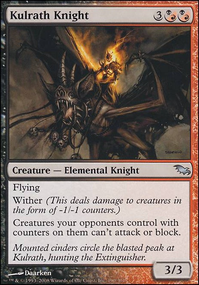 You put on the counter, then proliferate, killing anything with toughness 2 or less for 3 mana. The prolif effect is cheaper, and thus faster. Since you're playing mono-black, which doesn't have access to the same type of pump, you want more prolif. Also, if one of your infect creatures gets blocked, you can prolif the counters on what they blocked. I think 99% of the time it's a better card. Replace the Phyrexian Digester and the Guardians of Meletis with Core Prowler. It's another infect creature, and if it dies, then you get to prolif. Replace the Blackcleave Goblins with 2 more Ichor Rats, since they have a better etb trigger. Replace the Dark Favor and Deviant Glee with 4x Unholy Strength. 1 for 2 on 4 cards is better than one card being 2 for 3, and 3 cards at 1 for 2. Unholy Strength is also cheaper in dollar amounts. Finally, remove the Virulent Wound for 2x Throne of Geth (2 mana to add a poison counter), and 2x Hand of the Praetors. Even more finally, replace Untamed Hunger with Snake Cult Initiation. Use the Snake Cult on a flier since it stacks with infect. Yeah. Okay. Make the changes and I'll help you again after. :). Now lets move to the next card im sceptic about.. Deviant Glee. Removing the creature targeted by Deviant Glee as a response to it being cast is what is called a 2-for-1 (dont know how new you are, but you should be familiar with this term unless you are new new). I think even Lightning Strike would be better as its easier to resolve and Deviant Glee takes another turn, a creature and for that creature to survive to get more profit. Altho, i would not recommend Lightning Strike in modern. How about Bump in the Night or Lava Spike (or both?). I would reduce the number of Cryptborn Horrors to max 1 as they are very situational and maybe move 1-2 Ash Zealot to sideboard againt any Snapcaster Mage related matchups. Out: Rakdos Cackler, Slithering Shade, Dead Reveler, Rakdos Shred-Freak, Splatter Thug, Rakdos Drake, Gore-House Chainwalker, Demon's Jester, Grim Roustabout, Deviant Glee, Riot Spikes, Taste for Mayhem, Nettling Curse, Showstopper. In: Blood Scrivener, Desecration Demon, Helldozer, Hellraiser Goblin, Lobber Crew, Lord of the Void, Molten Primordial, Ogre Slumlord, Pack Rat, Sepulchral Primordial, Spawn of Rix Maadi, Stalking Vengeance, Breath of Fury, Five-Alarm Fire. LoneCrusader399 on Olivia bathes in your blood. Instead of playing cards like Furor of the Bitten and Deviant Glee which only pump one of your creatures, try cards like Obelisk of Urd, Metallic Mimic and Adaptive Automaton. 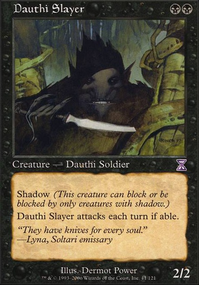 I'd rather play Grave Upheaval over Morgue Burst as it puts the creature right onto the battlefield with haste and it can also make certain hands more keepable with the basic land cycling. You don't have much card draw, add in cards like Phyrexian Arena, Harvester of Souls, Erebos, God of the Dead, Greed, Promise of Power, Read the Bones, Sign in Blood, Night's Whisper, etc. Whip of Erebos also seems like it would fit in quite well into this deck. 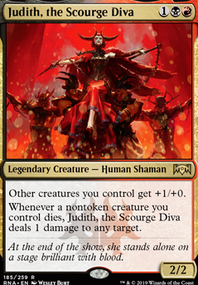 The7thBobba on $20 Rakdos "Goldfish Eater"
You're most welcome! Deviant Glee is also a blast! Thanks ToolmasterOfBrainerd!! I greatly appreciate your feedback. The only pairing I've done with discard is Tormenting Voice and Fiery Temper. But even then, if I don't have Fiery Temper in my hand when I want to cast Tormenting Voice it can be a pain, so I avoided that route here. The only creature with a cmc at 3 or above that I would like to keep is Lifebane Zombie. I've found that even though he's only a 3/1, having Intimidate out the gate has helped in some matchups. Once I'm able to get Brute Force or Deviant Glee out, he get's pumped. I have to agree with you as well, I've found that Bloodsoaked Champion is like a SLUG, and rarely play him. I'll definitely mess around with taking out the others and adding in some of the ones you suggested. I never knew about Bump in the Night, that seems like a really good fit here, as well as Lava Spike (don't know why I didn't think of that). The only time I've had success with Virulent Swipe is after blockers have been declared and I want to get rid of a creature. That's about it though lol. Madcap Skills does sound better than Deviant Glee so thanks for that suggestion! Thanks again for all your help!! I'll be playing around with it and see what comes out! !